I’m pretty late to jump on the quinoa bandwagon, but now I keep finding new uses for it. So watch out for recipes using this baby! As quinoa is something that’s increased in popularity only recently, I didn’t know that much about it nutritionally either. So I thought I’d share my research with you. Hailing from South America, and a staple of the Inca people for hundreds of years, quinoa is a wheat free alternative to starchy grains. It has a lot of the properties of typical grains (like rice and pasta) but isn’t from the same family, it’s actually the same family as chard, beets and spinach. However, as it is a cereal product, it’s considered a carbohydrate on the Eatwell Plate. Like other grains, quinoa is packed with fibre which helps keep your bowels healthy. It’s also a handy source of protein, especially for vegetarians or vegans; providing 9 essential amino acids in higher concentrations than found in other grains. Having fibre and protein together helps keep you full, so the mixture of these two found in quinoa also means that it is fabulous for those trying to lose weight. Quinoa is also gluten free, making it an excellent addition to the pantry of any coeliac. 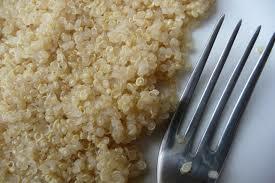 Finally, quinoa contains lots of micronutrients including; magnesium, iron, B-vitamins and calcium. Quinoa is incredibly versatile. On its own it has a subtle nutty taste which makes it a useful addition for soups, stews and curries as it won’t change the flavour too much. I would say it has a similar light texture to couscous, but has a slight crunch. I’ve eaten it hot and cold and both ways it tastes fantastic! I’ve used it as a replacement to rice, oats and even trialed some recipes that traditionally use pasta. I’ve also made quinoa porridge, see my recipe here. It’s really important to rinse your quinoa before cooking it, as otherwise the coating on the grain leaves a bitter taste. Once you’ve rinsed it well, you can cook it as you would rice. It takes about 15 minutes on the hob and you can tell when it’s done by watching out for the seeds splitting open slightly. Quinoa features regularly in our diet, and I’m enjoying experimenting with what else I can do with it. It’s a great alternative to traditional grains and has added nutritional benefits too. Variety is the spice of life so as far as I’m concerned it’s a fab addition to a healthy balanced diet. There are quite a few quinoa recipes online, but keep an eye out for the ones I post too. I’d also love to hear your suggestions!